The Heavy Ion runs are continuing at the Large Hadron Collider with 69 bunches per beam being circulated. Next they will increase to 121 bunches. Watching live collisions is very impressive when these runs are active. The live 3D CMS display is especially worth looking at but you need to keep refreshing the image. Meanwhile plans for next year are beginning to take shape and a presentation by Mike Lamont yesterday gave some details. Although no definite decisions have been taken, they are now talking in terms of a slight energy increase to 4 TeV per beam. The amount of luminosity collected will depend on the exact parameters used and how efficiently the collider runs. Using “reasonable” numbers (936 bunches, beta* = 2.5m, 120 billion protons per bunch, 3 micron emittance) it should be possible to collect about 2.2/fb, more than twice the target value. With “Ultimate” numbers (1400 bunches, beta* = 2m, 150 billion protons per bunch, 2.5 micron emittance) , it may be possible to reach 7.6/fb next year. Reality is likely to be somewhere between these two numbers. This entry was posted on Saturday, November 13th, 2010 at 10:44 am and is filed under Large Hadron Collider. You can follow any responses to this entry through the RSS 2.0 feed. Both comments and pings are currently closed. Not exactly the same, but still impressive when the tracker is turned on! The ATLAS display at http://atlas-live.cern.ch/ is good too. The ALICE live public display does not seem to work so well, but they have done some great animations and pictures. Certainly good news! 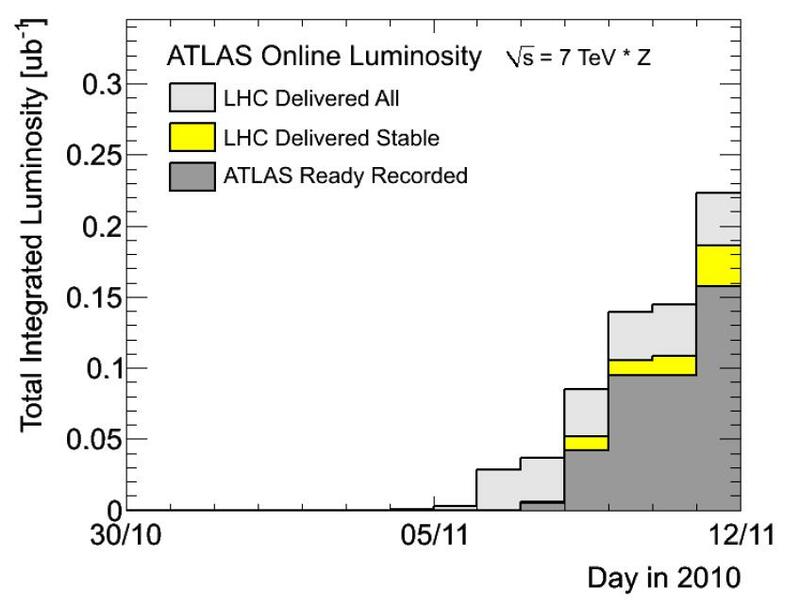 Both the increased energy and the increased luminosity target will bring the Higgs that much closer. And in our lifetime! The plan has “always been” (since the accident) to start at 3.5 TeV and then go to 4.0 or 4.5 if possible. Question: is it worth it? The danger point is believed to be at 5 TeV, so 4.0 seems safe. But the LHC has only been commissioned for 3.5, so an energy increase will require another round of hardware commissioning, which they have allowed for in the schedule, most of February, with beams to start in March. What do we gain by this? Two things. Much increased sensitivity for heavier particles (whichever heavier particles you happen to believe in, plus also heavier Higgs.) Also somewhat larger cross-section for Higgs production in general. Good points. These expectations for next year should really make an extension of the Tevatron a non-starter. The LHC will be well ahead of them even before the next shutdown. I wonder if there is something in the data gathered so far, that makes them go to 4TeV, maybe a heavy SUSY particle which has a much larger cross section at 4TeV. Could that be likely?